It never fails; as soon as October rolls around, marketers begin their annual assault of pink-ribbon products in the name of breast-cancer awareness. It's a seductive concept, really: Buy specially marked packages of frozen TV dinners and 37 cents goes to breast-cancer research, or pick up a fuschia immersion blender and an unspecified portion of the proceeds goes toward advancing women's health. But corporations have hijacked a well-meaning campaign into little more than a marketing ploy, one that threatens to undermine and infantilize the second-leading cause of cancer among women in the United States. Here, we list 10 of the most egregious examples of what cancer crusaders have come to call "pinkwashing." 1. How much money from your purchase actually goes to the cause? 3. How much money was spent marketing the product? 4. How are the funds being raised? 5. To what breast cancer organization does the money go, and what types of programs does it support? 6. What is the company doing to assure that its products are not contributing to the breast cancer epidemic? 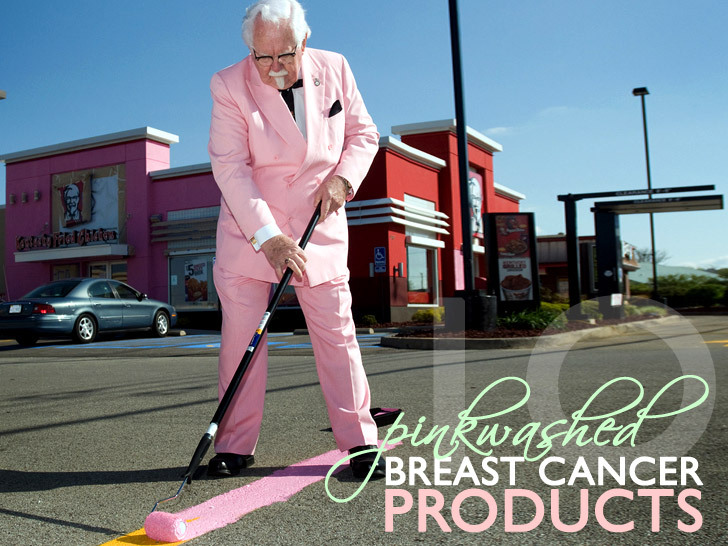 Of all the incongruous merchandise to get a pink-over, KFC’s “Buckets for the Cure” must rate as one of the most surreal. Never mind that the National Cancer Institute associates colorectal, pancreatic, and breast cancer with “high intakes of well-done, fried, or [barbequed] meats,” nor the fact that the fine print indicates a guaranteed contribution of $1 million to Susan G. Komen for the Cure—no purchase of buckets, pink or otherwise, necessary. 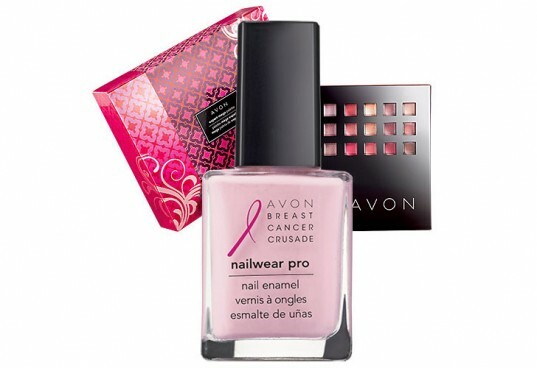 Avon, ubiquitous sponsor of many a breast cancer walk, continues to use the disease as a platform for brand recognition. Yet it flagrantly hawks products that harbor many of the toxic chemicals associated with the same cancer it seeks to eradicate. The Environmental Working Group’s Skin Deep database classifies more than 140 of Avon’s products as “high hazard” due to the presence of hormone disruptors, neurotoxins, and possible carcinogens. 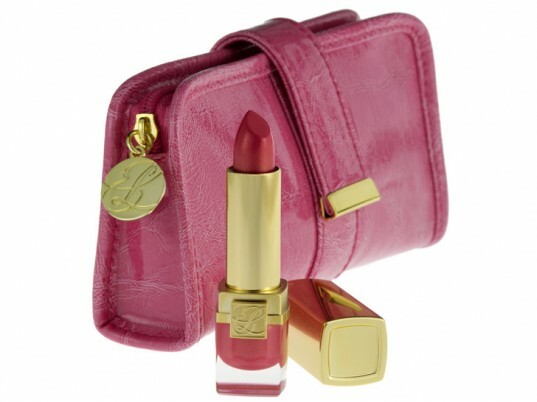 Estée Lauder has a “brilliant way” to show your support of breast-cancer awareness: lipstick in your choice of “Evelyn Wildly pink” or “Lavish pink” in a pink croc-embossed clutch. (The company will donate 20 percent of the suggested retail price of its Pink Ribbon Collection to the Breast Cancer Research Foundation.) The irony? The rosy-hued wares are chockfull of reproductive toxins, hormone-disrupting chemicals, and carcinogens. As a member of the Personal Care Products Council (formerly known as the Cosmetics, Toiletries and Fragrance Association), Estée Lauder also opposed a 2005 California bill that required cosmetics firms to disclose their use of chemicals linked to cancer or birth defects. 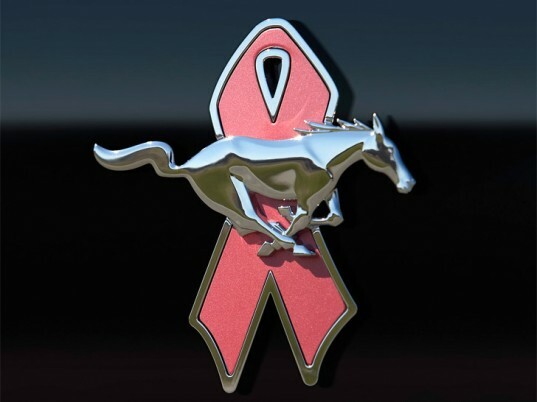 You’ve seen the ads: Ford, Mercedes, BMW, and Fiat are urging folks to test-drive or buy its latest hot rod by promising cash for breast-cancer research for every mile driven. Yet car exhaust brims with toxic chemicals that are linked to the disease, such as benzo[a]pyrene, dibenz[a,h]anthracene, benzene, and 1,3-butadiene, each one nastier than the last. In fact, occupational exposure to 1,3-butadiene suggests increased rates of multiple cancers, including the amplified risk of mammary tumors, according to the International Agency for Research on Chemicals. 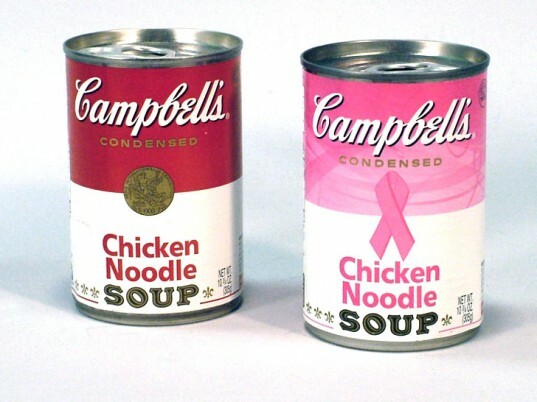 In 2008, Campbell’s partnered with the Kroger chain of supermarkets to fete a limited-edition pink label on its chicken-noodle and tomato condensed soups. To Campbell’s credit, it pledged to donate $325,000 in support of breast-cancer research, detection, and treatment, regardless of how many units Kroger pushed. A recent study by the Breast Cancer Fund, however, uncovered alarmingly high levels of bisphenol-A in cans marketed at children. Estrogenic chemicals linked to breast cancer in lab studies? Mmmm, mmm, not so good. By now it shouldn’t surprise you that Philosophy’s “Hope in a Jar” moisturizer doesn’t contain hope. Sure, $5 from every purchase benefits the Breast Cancer Research Foundation, but you’ll also get a hefty dollop of chemical nasties, including methylparaben and propylparaben. Parabens are a class of chemicals thought to mimic the hormone estrogen, which some studies show plays a role in the development breast cancer and urogenital abnormalities. 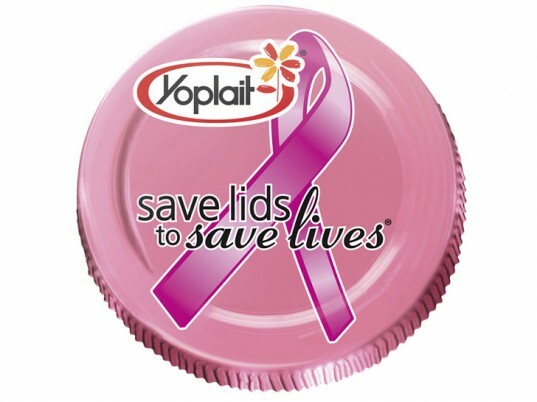 For every pink yogurt lid you send in until December 31, Yoplait will donate 10 cents to Susan G. Komen for the Cure until it reaches $2 million. Simple, right? Except that it costs 44 cents just to buy each stamp, not to mention the fact you’ll need to down 100 yogurt cups for a middling $10 contribution. But fuzzy math aside, until recently, Yoplait also contained rbGH (or recombinant bovine growth hormone), a synthetic hormone with unresolved questions about its impact on human health, including cancer. 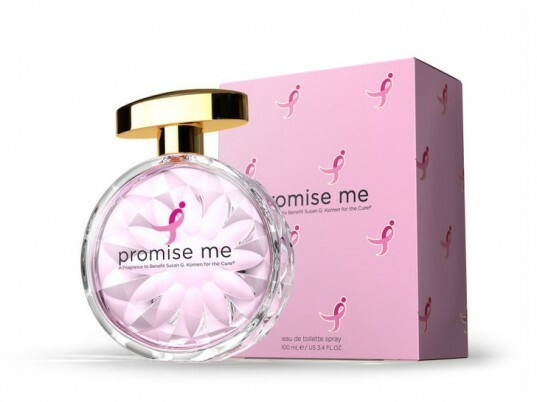 Susan G. Komen for the Cure is typically at the receiving end of the cause-related largesse, but the largest private charity dedicated to breast cancer has commissioned its own dubious tie-in: a perfume, dubbed “Promise Me,” that contains a number of suspect chemicals not listed in the ingredients, according to a third-party analysis contracted by Breast Cancer Action. Topping the list are galaxolide and toluene; the first is a hormone disruptor that’s been detected in blood, breast milk, and newborns, while the second is a neurotoxin banned by the International Fragrance Association for a variety of demonstrated health effects. Plus, at least to one calculation, only $1.51, or 3 percent of each $59 sale, will actually go to furthering breast-cancer research. Bloomingdale’s “Little Pink Campaign” even comes with its own “Little Pink Bag.” It gets brownie points for Stateside manufacturing, but it’s also made of polyvinyl chloride, or PVC, which leaches a class of plasticizers known as phthalates into the air. Phthalates have been linked to a host of reproductive ills, according to the’ U.S. Center for Disease Control and Prevention, including early breast development in otherwise-healthy girls. Pink your drink by hosting a “Cupcakes and Cocktails” soiree—preferably with Chambord’s raspberry-flavored tipple, of course—and the liquor company will bequeath $5 to Fashion Targets Breast Cancer for every guest you invite, up to a maximum donation goal of $10,000. But both the American Cancer Society and the National Cancer Institute say even moderate drinking increases breast cancer risk. “Anybody trying to sell alcohol to promote breast cancer awareness should be ashamed of themselves,” Barbara Brenner, executive director of Breast Cancer Action, told U.S.A. Today in 2010. This is an awesome article Jasmin - nice work! So, it hasn't been just my imagination that some of these "pink" offers are ridiculous, some of the supposed benefits doubtful, and the result of years of donations is still pitiful? B.C. "survivor" - not! Just living with it. For folks asking "Why be hating?" When businesses support a cause, they are also advertising their products and enhancing perception of the social responsibility rating of their products and business conduct. When there is contradiction inherent in business practice or composition of product, or if the cost to market the "benefit" outstrips the value of the donation, then it is fair game to interrogate that practice or product, to burst inaccurate consumer perception that she/he is indeed doing "good" by purchasing a given product or service marketed as part of the "the cure." If these companies *really* cared about stopping breast cancer, they wouldn't manufacture the toxic products that contribute to it! Anyone else pick up on the irony of the B of A pink ad on the right of the page for this article? 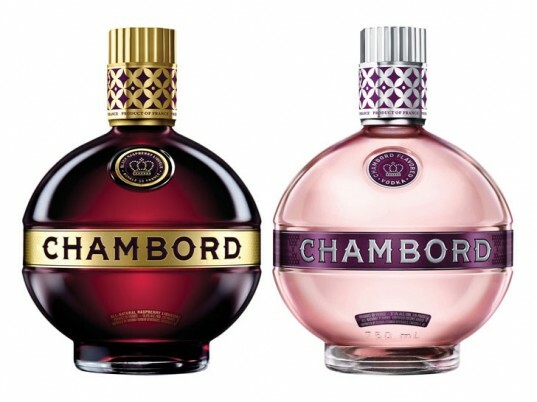 I would replace the last mention (Chambord) with the B of A Pink Washing. Give B of A a blasting and give alcohol an "Honerable Mention" at best. Cheers to awareness. Thanks for posting! I've come to hate SBG month and prefer to support the prevention of cancer by attacking the causes before they create damage. Great article, I wasn't aware of most of this stuff. From now on I will make a donation directly to cancer research rather than think that any of this is actually going to help. Especially if what they are putting out is hurting us rather than helping. I just want to say... you should consider the good that has come from these companies support. Honestly, I wouldn't think to myself "I have 5 extra bucks this week. I'm going to donate it." I would think though "Oh. They are going to donate 5 bucks to research. That's nice. I will go ahead and buy it." And if you are purchasing anyway and it happens to donate a small percentage to your fav charity... BONUS!!! Yes. I do agree that manufacturers should re-evaluate what goes in to their products but without their donations, there would hardly be any. Avon, ubiquitous sponsor of many a breast cancer walk, continues to use the disease as a platform for brand recognition. Yet it flagrantly hawks products that harbor many of the toxic chemicals associated with the same cancer it seeks to eradicate. The Environmental Working Group's Skin Deep database classifies more than 140 of Avon's products as "high hazard" due to the presence of hormone disruptors, neurotoxins, and possible carcinogens. 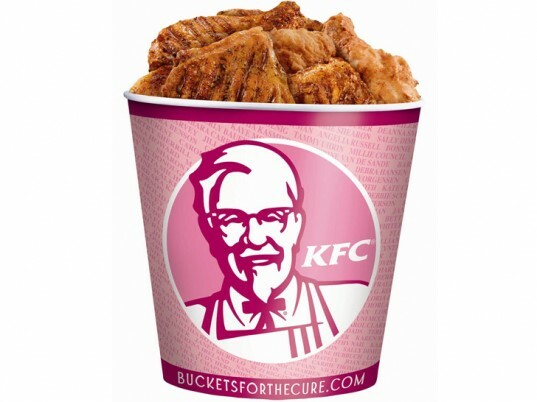 Of all the incongruous merchandise to get a pink-over, KFC's "Buckets for the Cure" must rate as one of the most surreal. Never mind that the National Cancer Institute associates colorectal, pancreatic, and breast cancer with "high intakes of well-done, fried, or [barbequed] meats," nor the fact that the fine print indicates a guaranteed contribution of $1 million to Susan G. Komen for the Cure—no purchase of buckets, pink or otherwise, necessary. Estée Lauder has a "brilliant way" to show your support of breast-cancer awareness: lipstick in your choice of "Evelyn Wildly pink" or "Lavish pink" in a pink croc-embossed clutch. (The company will donate 20 percent of the suggested retail price of its Pink Ribbon Collection to the Breast Cancer Research Foundation.) The irony? The rosy-hued wares are chockfull of reproductive toxins, hormone-disrupting chemicals, and carcinogens. As a member of the Personal Care Products Council (formerly known as the Cosmetics, Toiletries and Fragrance Association), Estée Lauder also opposed a 2005 California bill that required cosmetics firms to disclose their use of chemicals linked to cancer or birth defects. You've seen the ads: Ford, Mercedes, BMW, and Fiat are urging folks to test-drive or buy its latest hot rod by promising cash for breast-cancer research for every mile driven. Yet car exhaust brims with toxic chemicals that are linked to the disease, such as benzo[a]pyrene, dibenz[a,h]anthracene, benzene, and 1,3-butadiene, each one nastier than the last. In fact, occupational exposure to 1,3-butadiene suggests increased rates of multiple cancers, including the amplified risk of mammary tumors, according to the International Agency for Research on Chemicals. In 2008, Campbell's partnered with the Kroger chain of supermarkets to fete a limited-edition pink label on its chicken-noodle and tomato condensed soups. To Campbell's credit, it pledged to donate $325,000 in support of breast-cancer research, detection, and treatment, regardless of how many units Kroger pushed. A recent study by the Breast Cancer Fund, however, uncovered alarmingly high levels of bisphenol-A in cans marketed at children. Estrogenic chemicals linked to breast cancer in lab studies? Mmmm, mmm, not so good. 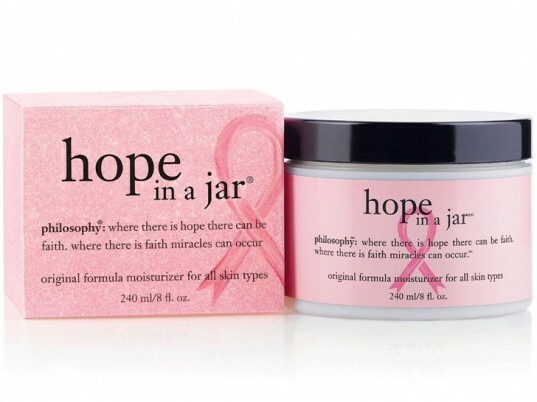 By now it shouldn't surprise you that Philosophy's "Hope in a Jar" moisturizer doesn't contain hope. Sure, $5 from every purchase benefits the Breast Cancer Research Foundation, but you'll also get a hefty dollop of chemical nasties, including methylparaben and propylparaben. Parabens are a class of chemicals thought to mimic the hormone estrogen, which some studies show plays a role in the development breast cancer and urogenital abnormalities. Susan G. Komen for the Cure is typically at the receiving end of the cause-related largesse, but the largest private charity dedicated to breast cancer has commissioned its own dubious tie-in: a perfume, dubbed "Promise Me," that contains a number of suspect chemicals not listed in the ingredients, according to a third-party analysis contracted by Breast Cancer Action. Topping the list are galaxolide and toluene; the first is a hormone disruptor that's been detected in blood, breast milk, and newborns, while the second is a neurotoxin banned by the International Fragrance Association for a variety of demonstrated health effects. Plus, at least to one calculation, only $1.51, or 3 percent of each $59 sale, will actually go to furthering breast-cancer research. For every pink yogurt lid you send in until December 31, Yoplait will donate 10 cents to Susan G. Komen for the Cure until it reaches $2 million. Simple, right? Except that it costs 44 cents just to buy each stamp, not to mention the fact you'll need to down 100 yogurt cups for a middling $10 contribution. But fuzzy math aside, until recently, Yoplait also contained rbGH (or recombinant bovine growth hormone), a synthetic hormone with unresolved questions about its impact on human health, including cancer. 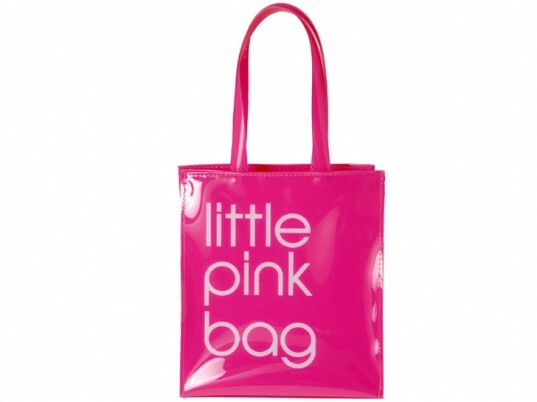 Bloomingdale's "Little Pink Campaign" even comes with its own "Little Pink Bag." It gets brownie points for Stateside manufacturing, but it's also made of polyvinyl chloride, or PVC, which leaches a class of plasticizers known as phthalates into the air. Phthalates have been linked to a host of reproductive ills, according to the’ U.S. Center for Disease Control and Prevention, including early breast development in otherwise-healthy girls. Pink your drink by hosting a "Cupcakes and Cocktails" soiree—preferably with Chambord's raspberry-flavored tipple, of course—and the liquor company will bequeath $5 to Fashion Targets Breast Cancer for every guest you invite, up to a maximum donation goal of $10,000. But both the American Cancer Society and the National Cancer Institute say even moderate drinking increases breast cancer risk. "Anybody trying to sell alcohol to promote breast cancer awareness should be ashamed of themselves," Barbara Brenner, executive director of Breast Cancer Action, told U.S.A. Today in 2010.